Ratatouille was in love with whimsy and fable and Wall-E with romance, minutiae, and slapstick humanism, but Up is at its proudest when it is having the most fun in the world being itself. It all begins with a boy, Russell (Jordan Nagai) asking curmudgeonly old drag of a man, Carl Fredricksen (Ed Asner), to help him earn a merit badge, but it most certainly doesn’t stay there for long. Pixar’s trip through surrealism, Warner Bros’ Bunuel-inspired Wackyland, Road to movies, ’30s adventure serials, and filmic flights of fancy more generally, Up sees the then-world’s most recognized film production company end their residency with practically owning filmic invention in the 2000s by paying tribute to all that allowed them to be what they had been so well and so singularly for fifteen years. But I lied: it doesn’t start with a young boy and a shell of a man. In fact, it begins much earlier, with that hollow surface of human plastic now being filled in. We open on young Carl, pugnacious and spirited and ready to go out and show the world what he’s made of. He’s obsessed only with his hero, TV explorer Charles F Muntz (Christopher Plummer), until he meets Ellie, who shares his star-reaching energy for life and matches it to her own genial, playful, springing bounce. They befriend one another, grow old together, fall in love, share times good and bad, and time eventually brings Carl to his knees with Ellie’s painful, slow death. They thought they might grow old together, and they did. But not quite as old as Carl might have liked. By the way, all of this is delineated to us in the span of ten haunting, deeply textured, elegantly direct minutes of pure cinema, a collage of space and time without dialogue to muddy the waters, manipulation at its most succinct and least ostentatious. It’s stunningly old-school cinema, yet it feels direct and elegant like a bullet from the future. Unfortunately, it leaves Carl’s future divested and distraught. But then, against his will, like a bullet of his own, there comes Russell. And when Russell and Carl collide, the two escape suburbia against both their interests and find humanity in the process. As for where they go, well, I don’t like to spoil, but the film lives on riches so wide they invite spoils. For Russell and Carl are magically whisked away to a world of lost beauty and adventure serial invention, a world of primal temper and eccentric peculiarities that see absurdism and clear, careful characterization acting in unison with love. Here the film knows no rhyme or reason but always pays homage to the gods of tempo and composition, introducing tone at will to suit its eclectic needs and careening back and forth between slapstick comedy and bruised, heightened emotion with form and subject acting as one. Up goes so far and so fast it sometimes feels like a plethora of films in one, melding cinematic styles young and old with the spirit of improvisational jazz, operating in that special place where fast threatens to overload into falling over oneself. Up operates at the edge of control, always tempting itself, but it never loses footing. Its dueling styles also capture with peculiar, tickling fascination the essence of the story, about an old man finding youth in adventure and a young boy finding age in maturity and human pain. The film marries human personalities bouncing off one another with tones and moods rattling about transiently, giving its characters up to its atmosphere and genre. In the end, they all come together as more than the sum of their individual parts, for the film yes, but also for the aching humans who populate that film. They learn and grow from one another to bond in one of the 2000s most effortlessly and artfully developed human relationships, like two tones clanging against each other until they meld in perfect harmony. If Up is minor Pixar in that it doesn’t reorient the nature of a genre by pushing toward its future like Wall-E, then it allows us the estimable pleasure of seeing what a company firing on all cylinders can do with a genre’s past. And this is all without mentioning Dug, a character of such purity and note-specific timing and sizzle he can’t but be loved. Oh Dug. But you should experience Dug like a newborn, fresh and without preface. As should you the jaw-dropping heft of the visual splendor that seeps off the screen; the look is Pixar at the top of their ability, from the sweeping, high-contrast vistas to the color-coded lunacy of the side characters to the superior nuances of the deft character construction, gifting Carl in particular with such a specificity of feel and economy of movement to convey dozens of emotions, sometimes within the course of a few seconds. It’s a narrative of high superlatives, positing a mystifying locale to get lost in, and to find oneself. 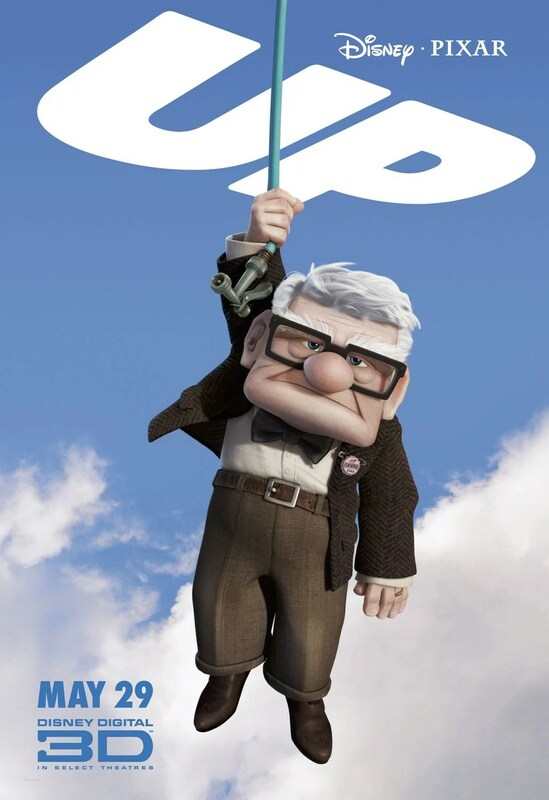 Up gives us rip-snorting adventure, side-splitting comedy, and heart-breaking drama, and it is three for three. This entry was posted in Film Favorites, Review and tagged animated films, cinematic playgrounds, Film Favorites, just plain fun, Score: 10/10, something lovely this way comes on December 26, 2014 by jakewalters98.